ADHD Conference – The World of ADHD According To S.P.A.C.E. The World of ADHD According To S.P.A.C.E. 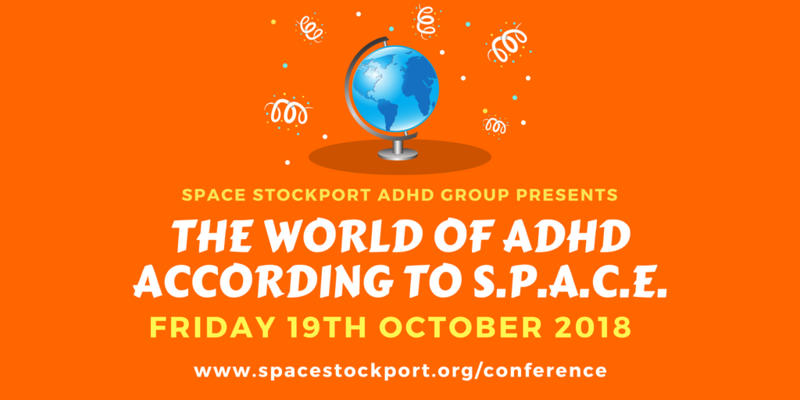 Tickets for the first SPACE Stockport conference – The World of ADHD According To S.P.A.C.E. are now on sale. This is a one day conference about Attention Deficit Hyperactivity Disorder. Without an accurate understanding of the condition, it can be difficult for people to understand why children with ADHD behave the way they do. Here at SPACE we are committed to raising awareness and fighting the various myths and damaging stereotypes associated with it. The content will be suitable for a general audience who have interest in the topic, but is particularly aimed at parents & carers and professionals who work with children and young people with ADHD. Throughout the day we will be sharing useful information on topics including behaviour and medication. The final schedule is still being adjusted but our speakers are confirmed along with the area they intend to discuss. This is available on our conference schedule page. Our conference will take place in Stockport, Greater Manchester. The Guild Hall has on-site parking and its location on the A6, near Stockport College makes it easy to access by public transport. Throughout the day there will be a number of speakers all sharing their professional knowledge and experience on ADHD including Consultant Psychiatrist, Dr Peter Mason. Tickets are available online from GetInvitedTo who take card payments using Stripe which offers secure online payments. If for any reason you would prefer to pay by another method, then please let us know and we will make alternative arrangements. We also have a limited number of bursary places available for parents and carers. Buy Tickets For The World of ADHD According to S.P.A.C.E.